Compare Our Website: We have more traffic and buyers. Google Loves Our Site, and We Can Prove It! Your home will be listed on one of the most visited Utah Real Estate websites on the internet. Our 15 websites have over 1,500 pages indexed in Google. You can search Google and see this is true. It is important to hire a highly skilled, experienced Realtor. It is equally important to hire a Realtor with Google internet power. This type of Realtor has the ability to properly market your Utah home, and not only get it shown to more buyers, but sold faster and for more money. You don't need to settle on a mediocre Realtor with a lame internet presence. The market has changed, and Utah buyers now start their home search on the internet. Hire a Utah Internet Real Estate Marketing professional. 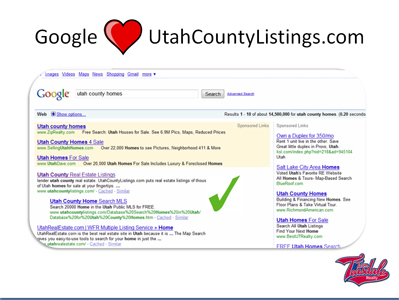 www.UtahCountyListings.com is ranked with many popular google keywords. Paul began publishing a Real Estate website in 1996. He launched www.PaulTeasdale.com in 1999 which a few years later became UtahCountyListings.com. 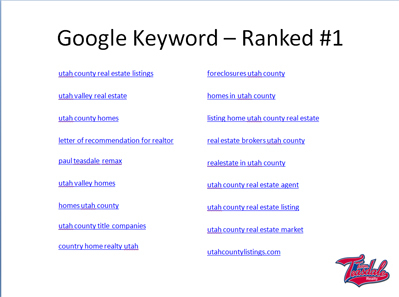 Hundreds of new Utah Real Estate websites are launched in Utah County each year. Google considers sites that have been around for a while to have more credibility which often results in a higher ranking. Hire a Realtor that has a website that can reach the out-of-state and international buyers. Team Teasdale Realty uses Utah Internet Real Estate Marketing to sell homes. Team Teasdale Realty has sold and listed homes directly from our website to not only out-of-state buyers but international buyers this year. Alexa.com ranks the most popular websites in the world. Our site currently rank as the 302,747th most popular website in the United States. Many SEO and web developers use this site to consider their popularity. Out of 1,500 Realtors in Utah County, I am only familiar with about two other Utah County Realtors who have similar high rankings. If you are considering hiring a Realtor who claims his/her website is awesome, check the site's popularity throughout the internet. 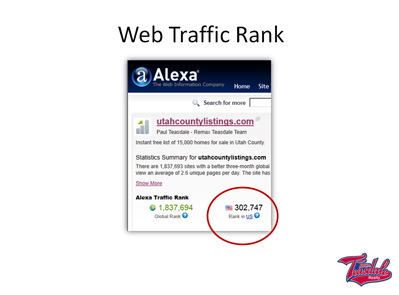 Alexa ranks the 10 million most popular sites in the USA. If the site doesn't rank on Alexa, it doesn't even make it to the top 10 million. Visit Alexa dot com, and compare sites. Hire a Utah Internet Real Estate Marketing Realtor to sell your home.